We can learn a lot from the Weimaraner. How to play. How to be loyal. How to rest. In our experience, the Weimaraner has two speeds–on and off. Do not be mistaken, on is full speed ahead and grab that table lamp before it goes flying. The mellow Weimaraner request is pretty much an oxymoron. True, some are less energetic; however, the energy is not the big issue. It always comes back to your relationship and the very nature of how it works. A right relationship is one where the Weimaraner respects you (and of course, you respect them). It is ideal that the Weimaraner wants to please you, and that you have found a way to get them into compliance. Obedience on the loose walking lead as well as a reliable recall (them coming when you call) is essential. All Weims are happiest when they are in control–they love being off leash, and it is nice to be able to have this luxury. Nevertheless, if the Weim is not in absolute leash compliance (on the leash), they are at risk. There is nothing worse than having the Weimaraner that pulls you down the street or lunges at everything as you try to walk them. It is bad manners and ultimately dangerous for you and them. Avoid this scenario. Getting off the tether also requires that achieving the strong recall. If they only come when they get around to it, it is again a dangerous situation. Many people struggle with these two disciplines. They ask for everyone’s advice and often end up using a head halter, front clipping harness, or the Gentle Leader scenario. Others opt for a prong collar. None of these are things we can recommend in good conscience yet a goodly number of Weim folks rely on them. The underlying danger (when using these devices) is that you do not have a compliant and willingly obedient Weimaraner. You gain control using the device, but your Weimaraner is only deferring because the device (special harness or lead) prevents them from pulling and lunging. This scenario is not ideal. We recommend getting these disciplines mastered early, so you have a better and safer outcome. It is a plus for you as well as the Weimaraner. We have received two beautiful Weims from Cliff and Shela! They were able to match us up great. Bella (3yrs old in November) and Daisy (1yrs old in October). They are truly the best, thank you two for all that you have done for Darilyn and me! Dear Friends and Fellow Weimlovers! We thank you for the endorsement on Facebook as well as the loyalty you generously have bestowed on us. People like you make the work and effort (raising the Weimaraner) well worth it. Bringing joy to others is no small thing. We also realize the effort it has taken to raise the two and to get to this point. Thank you for following through and digging deep to get the job done. Bella still doesn’t swim but Daisy loves too! I’m hoping that Bella with follow her younger sister some day….we also played a little dress up with Daisy….don’t know if you remember Bella wearing here tutu, but this is the same one! Hope all is well with you guys. We are going on our first camping trip with the girls this year…wish us luck! Cliff’s Comment: Do not give up. Miss Bella can swim, it is a matter of getting her to want to. A lot of patience, and optimistic posturing can overcome their concrete idea that they don’t do that. It is great you have Daisy Swimming! We are doing fine since we have added Daisy (our longhair girl) to the family. I retired from the Navy on 16 January and I start my new career on 9 February. The weims have been keeping me busy. Daisy had a check up today and she weighs 23.6 lbs and Bella weighs 67.4 lbs. Darilyn is working hard and I’ve been doing a little relaxing. I read your blog news about your last treatment and we are so happy for you! How are you feeling? Comment From Shela: Thank you for asking. Yes, we are thrilled that the actual treatment is done. Of course, the doctors are never done–that is a good thing. I have appointments tomorrow, and next week. It is nothing huge, but it will be on-going. I am doing some special massage to relieve the swelling in the arm caused by the surgical removal of the lymph nodes. I am also doing acupuncture–the first treatment didn’t fix me per say; however, I am amazed that it made a difference. The external damage from the radiation is healing; there is less pain every day. They tell me that the effects of radiation keep giving for about two weeks. Of course, we know there are further consequences, but sometimes you have to do what needs to be done. It seemed like the right choice. Overall, we are doing a lot better. Thank you for asking! Just a quick picture of Bella. She is two now and runs the house. She has filled the house now that it’s an empty nest! She is the best. Wow, what an adventure this has been. We started the long process back in June with packing up the house, shipping the car and having renters take over our home for our move to Naples, Italy. Tiga, throughout the preparation process was a little nervous but really did quite well despite all the changes. He stayed with our neighbors for about 3 weeks as we were “Homeless”, but we reunited a few days before our flight to make sure he still loved us and to get all the USDA health data taken care of. On the morning of July 14th, the shuttle van picked us up, our 12 suitcases and 1 nervous dog in a kennel and off we went to Seatac to begin our 18 hour trip. Tiga did really well throughout the process, in fact he did not go potty in his kennel for the entire trip. Man was he ready to get out as soon as we landed, but I am so glad we did kennel training from the start. So now that we have arrived at our new assignment, Tiga has ventured out a little bit, but the acclimation process for the heat has been difficult for him so far (man is it hot!!!!!). He is also getting used to the unfortunate military leash law and not liking it much. We visited a ancient Roman Burial Site on the base we live on, and have made visual contact with too many cats, a few foxes and a Weimaraner that looks just like him. The kids and Tiga think the three flights of stairs are pretty fun to run up and down, so we are sure this is going to be a great opportunity for all of us. Breeder’s Comment: We are so happy to learn that the entire family made is safely to Italy. 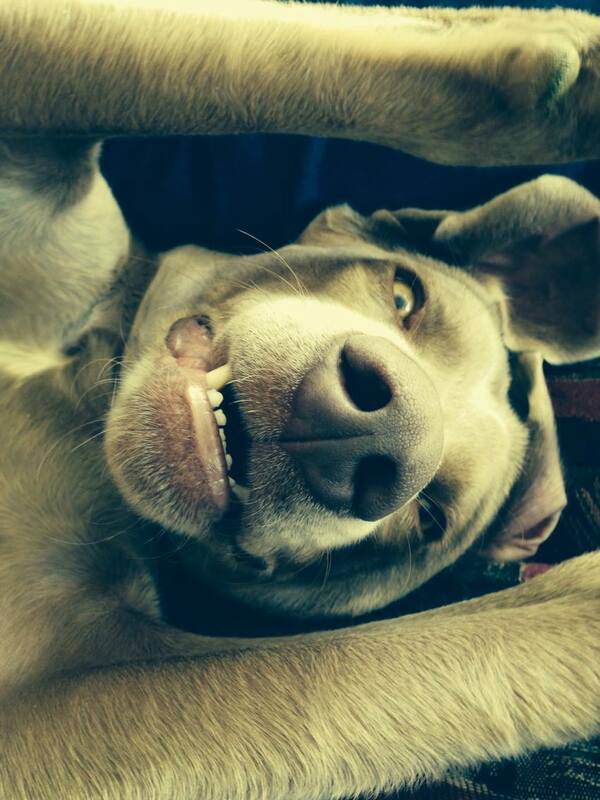 Tiga’s adjustment is a testament to how well you have done at raising your first Weimaraner. We look forward to following your adventures. Thanks for the update. We know you are very busy.